A dry spread application fertiliser that has a high potassium content to encourage fruit growth in crops with a high potassium demand. All nutrients required for plant growth are all in one granule. Nitrogen is present both as nitrate and ammonium (no urea). The readily available nitrate-nitrogen gives an immediate growth response, while the more slowly available ammonium-nitrogen ensures a long-lasting effect. Potassium is present as potassium chloride. The specific ratio of nutrients in TropiKa contain fast and slow acting nutrients to provide balance nutrition, making it an ideal fertiliser during the fruiting phase of crops with high potassium demand, without sacrificing nitrogen, particularly in high rainfall areas or sandy soils. Campbells TropiKa is a true compound fertiliser, not simply a mixture of different fertilisers pressed into a granular form (a granulated blend) or different fertilisers physically mixed together (a blended fertiliser). The consistent granule size range allows uniform application with no separation of nutrients. 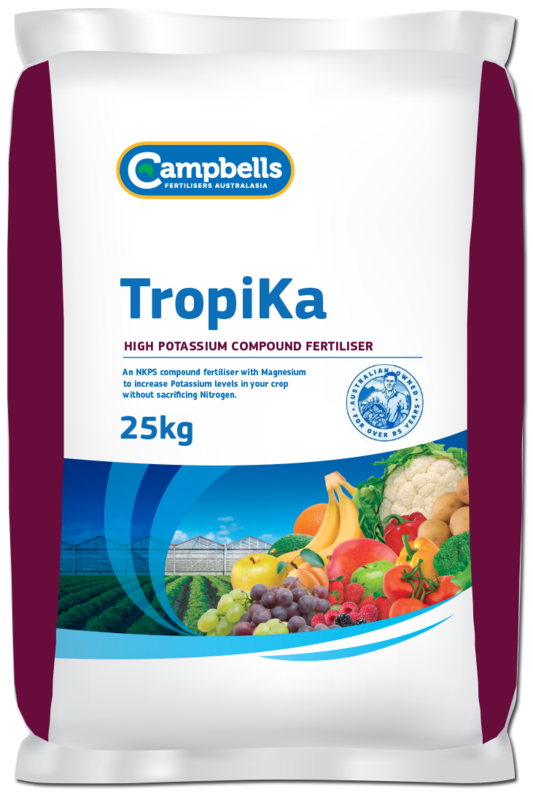 Campbells TropiKa is ideal as a side or top dressing. It is a non-dusting, free flowing product that can be applied as a band or broadcast to provide even distribution of nutrients. General rates for horticultural crops are between 150 to 600 kg/ha. The actual rates, number of applications and their timing will vary considerably for different crops and for different districts. Before application, seek advice from your Campbell’s TropiKa distributor or your local agronomist.